Glacial Lake Albany was a prehistoric North American proglacial lake that formed during the end of the Wisconsinan glaciation. It existed between 15,000 and 12,600 years ago and was created when meltwater from a retreating glacier, along with water from rivers such as the Iromohawk, became ice dammed in the Hudson Valley. Organic materials in Lake Albany deposits have been carbon dated to approximately 11,700 years ago. The lake spanned approximately 160 miles (260 km) from present-day Newburgh to Glens Falls. Lake Albany drained about 10,500 years ago through the Hudson River due to post-glacial rebound. When the lake drained it exposed the sandy and gravelly glaciolacustrine deposits left by the glacier, along a broad plain just west of Schenectady, where the Mohawk emptied into the lake. Dune and deltaic sands, containing lenses of silty sand, silt and clay, compose the topsoil which now underlies the Albany Pine Bush. Beneath the surficial deposits are lake-bottom silt and clay, which overlie till and shale bedrock. 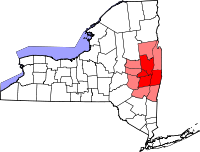 A small rill caused by the lake's drainage created Patroon Creek, Sand Creek, Lisha Kill, Shaker Creek, Delphus Kill and the Salt Kill in the town of Colonie, New York. ^ a b c d "Origins of the Albany Pine Bush". Albany Pine Bush Preserve Commission. Retrieved 2010-10-17. ^ Dawicki, Shelley (2004-12-15). "Catastrophic Flooding from Ancient Lake May Have Triggered Cold Period". Retrieved 2010-10-17. ^ a b "How did this land form?" (PDF). SUNY ESF. August 2001. p. 2. Retrieved 2010-10-17. ^ De Simone, David J.; Wall, Gary R.; Miller, Norton G.; Rayburn, John A.; Kozlowski, Andrew L. (May–June 2008). "Glacial Geology of the Northern Hudson through Southern Champlain Lowlands" (PDF). Northeastern Friends of the Pleistocene. University of Maine. Retrieved 2010-10-17. ^ Franzi, David A.; Rayburn, John A.; Knuepfer, Peter L.K. ; Cronin, Thomas M. (June 2007). "Late Quaternary History of Northeastern New York and Adjacent Parts of Vermont and Quebec" (PDF). Northeastern Friends of the Pleistocene. University of Maine. Retrieved 2010-10-17. ^ a b "Geological History of the New York Area". Skidmore College. Retrieved 2010-10-17. ^ "State University of New York at Albany - Edward Durrell Stone's architecture, atmospheric science, and the geology under it". University at Albany, SUNY. Retrieved 2010-10-17. ^ "Surficial Geology: Sand Dunes". New York State Geological Survey. Retrieved 2010-10-17. ^ a b Williams, John H.; Lapham, Wayne W.; Barringer, Thomas H. (1993). "Application of Electromagnetic Logging to Contamination Investigations in Glacial San-and-Gravel Aquifers". Ground Water Monitoring and Remediation Review. USGS. 13 (3): 130–131. doi:10.1111/j.1745-6592.1993.tb00082.x. ^ Burger, Joanna (2006). Whispers in the Pines: a Naturalist in the Northeast. Rutgers University Press. p. 29. ISBN 978-0-8135-3794-8. Retrieved 2010-10-17. ^ "Town of Colonie: A Draft Comprehensive Plan" (PDF). Town of Colonie. May 2005. p. 23. Retrieved 2010-10-20. Reynolds, Richard J. (1997). "Hydrogeology of the Schodack-Kinderhook Area, Rensselaer and Columbia Counties, New York" (PDF). USGS. Retrieved 2010-10-17. Ruggiero, Kathleen M.; Rodbell, Donald T.; Garver, John I. (2008). "The Geological Evolution of Collins Lake, Scotia, New York, as Revealed From Sub-Bottom Profiles and Sediment Core Analysis". Union College. Retrieved 2010-10-17. "New York State Geological Association 39th Annual Meeting" (PDF). The New York State Geological Association. May 5–7, 1967. Archived from the original (PDF) on 2011-07-23. Retrieved 2010-10-17.